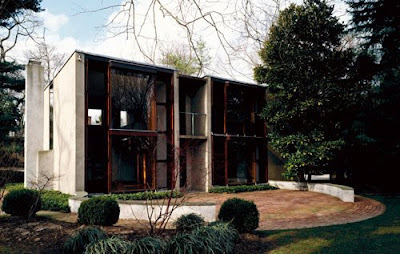 For lovers of modernist residential architecture there was mixed news this week. While the Richard Neutra Kaufmann Desert House (above) sold to an unidentified buyer for a respectable $16,800,000 ($19,000,000 including an adjacent plot), the Louis Kahn Esherick House (below) failed to reach its reserve. Both houses were offered for sale as part of Contemporary Art and Design auctions and their selling price was expected to far exceed their real estate value. Auctioneer Richard Wright, who was hoping to sell the Esherick House for between $2-$3,000,000, didn't blame the declining housing market for the failure to sell, pointing out that bidders at auction would be paying cash and not worrying about a mortgage. Christie's, who sold the Kaufmann House, were also disappointed that bidding was at the lower end of the valuation. 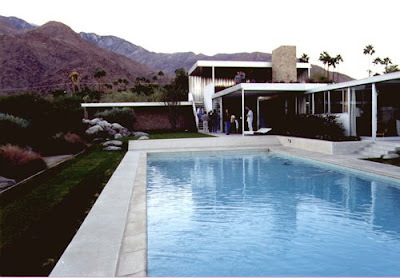 They had marketed the house as a work of art with a estimated price of between $15-$25 million.